I think that I can safely speak for many of us in the historical community (both writers and readers) when I say that we are – in the nicest way of course – rather nosy. That is, we want to know all about people from different times: what they looked like; what they did; how they did it. For instance, have you ever wondered whether people in the fourteenth century wore nightdresses or what the well off used to wipe their behinds with (I have!)? How about their pastimes, sense of humour or the difficulties of travelling? 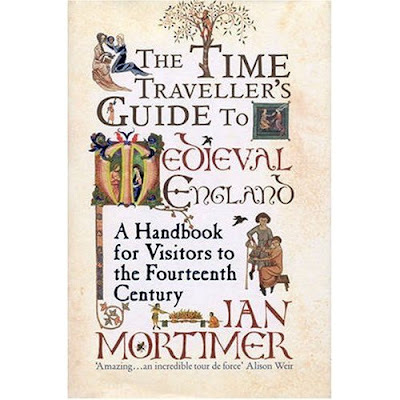 Ian Mortimer’s latest book: The Time Traveller’s Guide to Medieval England – A Handbook for Visitors to the Fourteenth Century certainly satisfies that craving for knowledge of the minutiae of daily life in the Middle Ages. The book is lovingly researched and well written with a light sprinkling of humour that makes it very easy to read. The style in itself is very original for a non-fiction historical book, using a ‘guidebook’ approach that is a million miles away from the stuffiness of many ‘academic’ books. Yet, happily, the book does not suffer from a lack of sincerity or historical integrity in any way. The topics cover a broad range of subjects for the ‘traveller’ from what the landscape will look like to what to wear, where to stay when travelling, and how to address different kinds of people that you will meet along the way. And then, of course, when they invite you to eat with them, you will know what food to expect. And then, of course, there is always the danger of falling ill. The Time Traveller’s Guide is once again at hand to tell you not only what may be wrong with you (hopefully not the plague, or leprosy!) and what medicine is available to help cure it. This book, then, is a wonderful read. To be fair, I could not find fault either with the style or the information it offered (much to my frustration – as I always like to find at least a little criticism to balance things). To anyone who loves this period it will open up new doors to understanding the social history of the time. For writers of Medieval fiction, it is a valuable sourcebook – full of the little details that we need to make our stories come alive. So yes, I heartily recommend this book as worth every penny. Tagged Ian Mortimer, review, Time Traveller's Guide to Medieval England. Bookmark the permalink. Great review of a great book, Lady D! It’s compulsory reading for anyone who loves the 14th century. This sounds like a must-have for me!! Great review, and the book sounds superb. This looks like such a great book (this is the second positive review I’ve seen for it), but I can’t seem to find it anywhere except the British amazon. Is it only being published in England? Do we in the New World have to wait? It really is a great book – I hope you all manage to get one in your Christmas stockings!